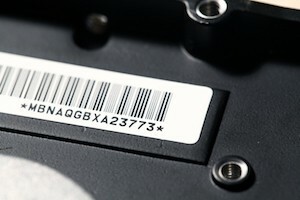 assets and feature serial numbers or barcodes for identification purposes. Most asset labels have adhesive backing and are made of anodized aluminum, laminated polyester, vinyl, or foil. The more durable the asset label, the easier it is for the organization to conduct asset identification, tagging, and tracking. Asset labels vary by material and size so they can best be matched to the asset on which they will be placed. The most common types of asset labels include those made of foil, anodized aluminum, polyester, or vinyl. Foil Asset Labels – Premium foil asset labels are made of anodized aluminum face stock and feature a high-performance permanent pressure-sensitive adhesive. These labels are used for indoor or outdoor asset tracking and include bar code and printed information that remain readable for the lifetime of the asset. Foil asset labels of the highest quality bond to metals and plastics as well as textured and contoured surfaces. It is a good idea to look for foil asset labels that can resist chemicals, abrasion, and solvents and that can withstand exposure to harsh environments such as those characterize by extreme temperatures. Aluminum Asset Tags – Top-quality aluminum asset tags have outstanding durability for harsh indoor and outdoor environments. These metal asset labels may contain the company name, asset number, and barcode information and are comprised of thicker anodized aluminum face stock and a high-performance permanent pressure-sensitive adhesive or holes for attaching with rivets or screws. As with foil asset labels, aluminum asset tags are designed to permanently bond to nearly any metal, plastic, textured, or contoured surface, and they should be designed to resist chemicals, abrasion, and solvents. Aluminum asset tags also are recommended for harsh environments. 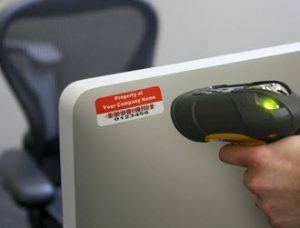 Tamper-Evident Asset Labels – If you are concerned about someone tampering with your assets, or if you want to protect against unauthorized transfer of your assets, consider tamper-evident asset labels. When someone removes these asset labels, the word “void” is left on the surface of the asset. Top-quality tamper-evident asset labels bond to high and low surface energy plastics, stainless steel, glass, and nylon and resist general purpose and household cleaners, mild acids, oil, and water. Destructible Vinyl Asset Labels – To discourage unauthorized asset transfers, consider using destructible vinyl asset labels. Constructed of vinyl face stock, these labels break apart when separated from the asset surface, so a person cannot remove them in one piece. Destructible vinyl asset labels adhere to high and low surface energy plastics, textured and contoured surfaces, powder coatings, and slightly oily metals. Removable Asset Labels for Short-Term Asset Tagging – Removable asset labels are designed for applications that require durable short-term labels that can be removed cleanly or repositioned easily. Typically, these asset labels are used for chemical drums, shipping containers, shelves, parts, and short-term asset-tracking applications. Asset labels are used to easily monitor inventory and assets, schedule routine maintenance, and avoid lost items. Companies that produce asset labels often work with clients to design custom labels perfect for your applications. Asset labels, also referred to as asset tags, identify any number of physical assets, from equipment and tools to racks and machines. Asset tags are used to identify physical what-is-an-asset-tag-label assets and feature serial numbers or barcodes for identification purposes.